And that was the beginning of what was perhaps the largest duck farm in the United States, moving from Tuckerton, PA in 1883 to a large farm on the Fritztown Road. After my grandfather’s death, my father Walter “Sol” Shearer (1912-2000), kept up the Shearer legacy. He purchased his own farm circa 1936 on Goose Lane in Gouglersville, where he built a business that was locally known as “Sol” Shearer’s Farm and Barbecue Ranch. 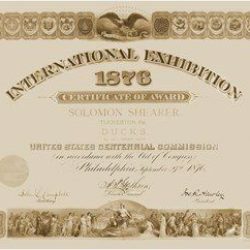 The Photo depicts the US International Centennial Certificate of Award presented to Solomon Shearer of Tuckerton, PA on September 27th, 1876. Solomon, who lived in Shearertown at the time, was given a certificate of award for one pair of Pekin ducks, commended as superior specimens of their breed. The exhibition was the first official World’s Fair in the United States and was held in Fairmont Park, Philadelphia, PA. It was quite the event, with nearly 10 million visitors attending the exhibition and thirty seven countries participating in it.